The story of The Lovecrave, born amongst the metropolitan ashes of the big city, Milan united with the gothic and silent atmosphere of Venice. The band is formed of two experienced rock musicians from Milan and two old, good friends of Venice origin that moved to Milan to make music. The mix of sounds is an explosive magic potion and The Lovecrave realized it right away when they played together for the first time.The experience and the great artistic discharge of every component of the band ooze like an evil Venice fog that covers your heart at the first listen. Experimentation and sound research have been fundamental, with no limits and with a never satisfied attitude, working during the night and putting every extra cent on the work. Tank Palamara, guitarist and producer of The Lovecrave, has 10 years of tours and rock productions under his belt, decides that it's time to get serious and the engine begins to run. Francesca Chiara, Venetian rock act of the Italian scene splits from Sony Music Italy and with her melodies and with her acid voice enchants The Lovecrave atmospheres. She takes care of all the graphics, curing every detail and she invents "Rain", her 3D alter ego. She also writes afiction story, "The angel and the rain", that pieces all the songs together and that will be found in the cd booklet. Iakk plays drums with Tank Palamara and Francesca Chiara for the past 3 years and he takes care of the live sets and organizes rehearsals. Simon Dredo, Francesca's best friend from high school, coming from a tour in England is the last to join the band as bass player in March 2005. Tank and Francesca, co-writers for many years, write about 15 songs in less than a month and that's how a live metal band becomes a serious project aiming to the music industry. 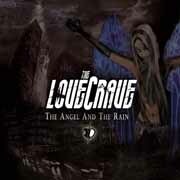 What The Lovecrave were looking for during the recordings was a rough, elegant and new sound at the same time, taking inspiration also from Iron Maiden and eighties sound to The Chemical Brothers, curing every detail but trying to leave that instinctive and rough edge untouched. They create in their mind a sort of "Blade Runner" world and try to put music in it.